How does one person win eight gold medals in one Olympics? Michael Phelps drew inspiration from a variety of sources - a careful study of this multi-pronged approach can help us as we drive to win our own personal Olympics in business, life, love, whatever it may be. When Phelps announced that he was going to go for eight golds, Australian gold medalist Ian Thorpe said it couldn't be done. Michael got his hands on the article, cut it out, and taped it in the back of his locker at the aquatic center where he was training in Michigan. Every day, multiple times a day, when he went into that locker, he looked at that article and thought about Ian's negative comments. When Michael was growing up, he kept a poster of gold medalist Pablo Morales on his bedroom wall. At the 1984 Olympics in Los Angeles, Pablo won two silvers in the 100 meter butterfly and the 200 meter medley and a gold in the 4 x 100 meter medley. In 1988, he failed to qualify only to come back as team captain in 1992, winning two golds in Barcelona in the 100 meter butterfly and the 4 x 100 meter medley. Pablo also held the world record in the 100 meter butterfly in 1984 and again from 1986 to 1995. 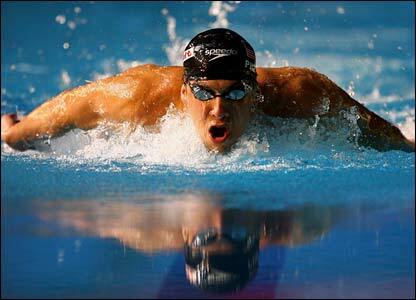 At the 2005 FINA World Championships, Micheal lost to Ian Crocker by 1.25 seconds in the 100-meter butterfly. In a press conference after the competition, Michael was furious with himself and ready to make a big change. "This entire year, and this world championships, have been a big wake-up call for me," he said. "I don't like the feeling of not doing my best. What happened here, I'm going to use for motivation, and hopefully by next summer, I'll be able to give [Crocker] a race. He sort of ran away with it. I wasn't even a factor." On Thursday, August 7th, swimmer Alain Bernard of France bragged that the French relay team would "squash" the Americans in the 400 meter relay. When Michael heard this he used it as fuel to fire the first leg of the race. In a photo finish, anchor Jason Lezak out-touched Bernard by .08 of a second. When Michael went up against Milorad Cavic in the 100 meter butterfly at the Beijing Olympics, coach Bob Bowman made sure Michael heard Cavic's now famous comment: "I think it would be good for the sport and good for him" if Phelps lost. Michael again used a comment to fire the run down his lane and out-touched Cavic 50.58 to 50.59. Michael also kept a "wish list" on his computer - a list of world record and gold medal dreams. He looked at this list every day, focusing on his goals. When asked after Phelps had won the eight golds how he had inspired the swimmer, Bowman said he taught Phelps to use his imagination. Likewise, Phelps also reported when interviewed after the last race that his imagination was a key to his success. Drawing inspiration from negative comments, positive role models, loss, lists, and his own imagination, Michael Phelps surpassed Mark Spitz's record to be the most decorated gold medalist in a single Olympics. My hope is that we can all become Olympians in our own lives by finding motivation and inspiration in the good, the bad, and the ugly we face day to day.